Christmas 2016 is now only a set of memories. The first preschool performance of our granddaughter, Elena. Picture a stageful of two-to-four-year olds singing off-key with cherubic enthusiasm. Delightful. Christmas Eve dinner with family in a lovely restaurant, and then an outstanding church concert afterwards. A gathering of eight around the Christmas tree to open presents—seven family members and one adopted uncle (a friend of our son’s who could not get home for the weekend). Now it’s time to finish up or freeze all the leftovers from holiday meals. 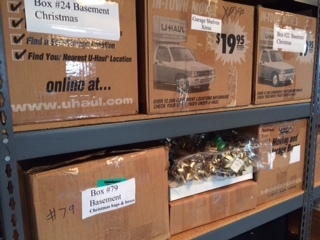 Soon we’ll have to bring up the boxes from the basement and undecorate (the most deplorable of chores) while listening to Christmas carols one last time. And as folks around the world put away the ornaments, wreaths, and fairy lights, many will put away their cheerfulness and good will. There will be fewer smiles and happy greetings, fewer kindnesses and generous gestures. “Christmas need not be limited to only a day. 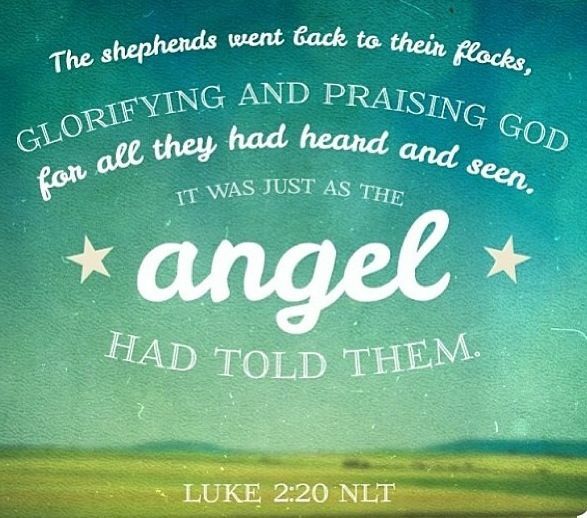 My new attitude could take inspiration from the shepherds who, after visiting the stable, returned to their flock glorifying and praising God for all the things they had heard and seen (Luke 2:20). Surely their glorifying and praising was not just a temporary state. Of course, the intense euphoria lessened with time. It would be impossible to live with that level of excitement long-term. Who could eat or sleep? But I can picture them, sitting around their campfire year after year, frequently reminiscing about that night. I can see their soft smiles, recalling how terrible fright had turned to gleeful joy. And I see the shaking of their heads in wonder, remembering that they were among the first to look into the face of the long-awaited Messiah. What an incredulous privilege. That kind of elation never grows old. 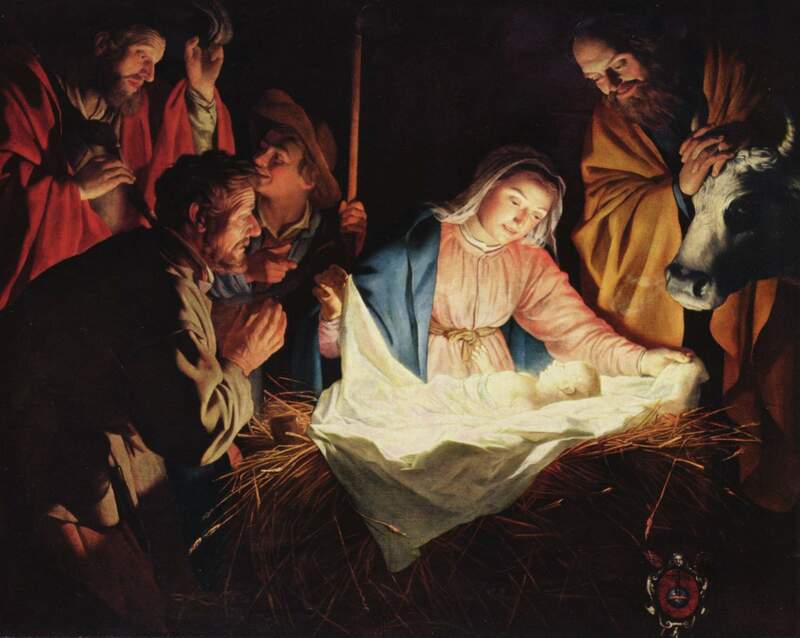 I have a feeling those shepherds were never the same after that night. Their families—even the village of Bethlehem—were impacted by the effervescent joy that overflowed from their lives. After all, they had seen the Lord. I, too, have encountered him in my spirit. But when post-Christmas melancholy comes calling, my thoughts gravitate toward disappointment that the beauty, excitement, and wonder of the season is over. 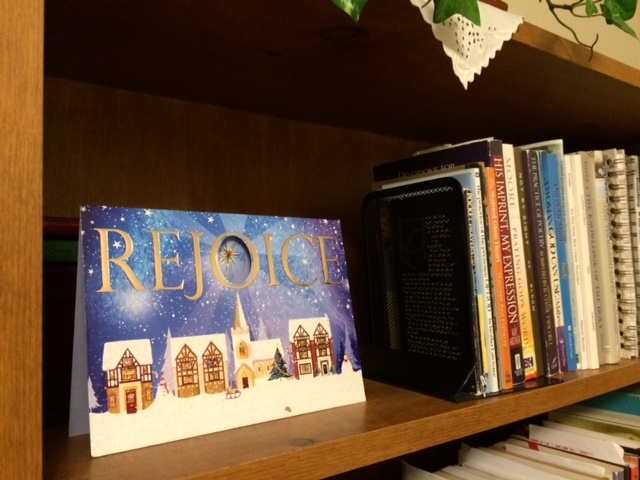 As I pack up all the decorations, may my thoughts center on the joy Jesus provides—not just for the Christmas season but always. May I look forward with anticipation to the experiences God has planned for me and the growth he’ll achieve in me during the new year—even as I fondly look backward on the sweet memories of Christmas past. 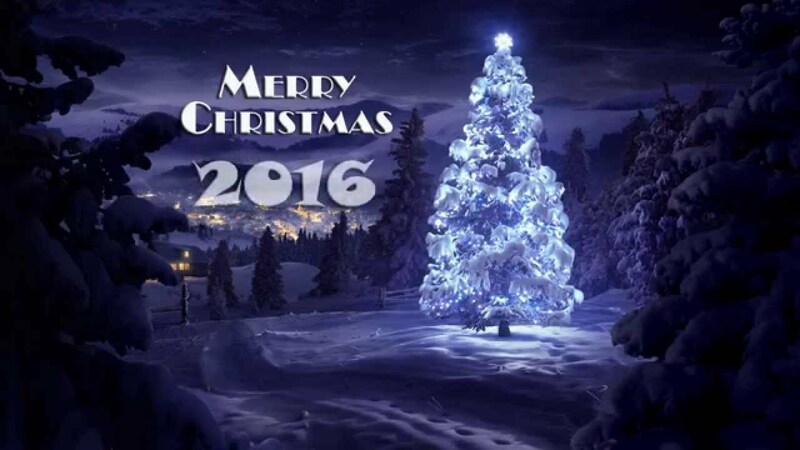 May I begin to develop a Christmas attitude that will last the whole year through. No need to wait until next year for Christmas joy after all. (Art & photo credits: www.youtube.com; Nancy Ruegg; http://www.pinterest.com; http://www.wikipedia.org; Nancy Ruegg (4). P.S. For 2017, beginning next Thursday, January 5, I’ll be posting just once a week in order to allow time for other projects and for assisting our son and daughter-in-law when Baby Girl #2 arrives (sometime mid-January). I do hope you’ll still return each Thursday for a new post. So glad the card-tucking idea appealed to you, Ginny. And thank you for your excitement over the addition to our family. I’ll keep you posted! 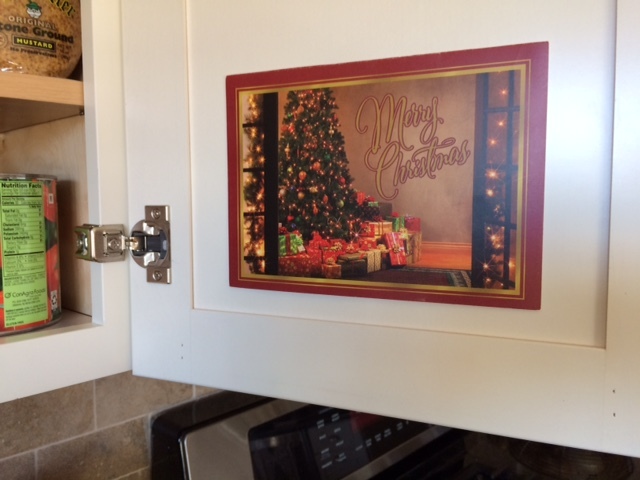 Very good Nancy and like the thought with the Christmas cards.Congratulations on the new grand baby. You and Steve have a Happy, Blessed, Healthy 2017. Thank you, Janet, for being such a loyal reader and encourager. May 2017 be filled with many blessings and glorious moments for you, too! I love the Christmas card idea! 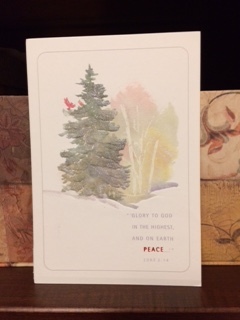 Thank you, M. H. How delightful to know that others might join me in recapturing Christmas joy with cards hidden around the house! Lovely words and scenes from your house, Nancy. And congratulations on a new little girl (soon!). Blogging once a week is such a wonderful practice–excellent decision. Thank you for your encouragement and support, Jody. ALWAYS appreciate when you can stop by here. God bless you, my friend, as you move forward in God’s plan for 2017. Perfection! Melancholy does seem to descend into many as a new year begins. Indeed, it can be a great time for renewal and praise. So wise of you to post weekly. I’m just grateful that you are continuing with your blog. Our family, too, is expecting a new baby girl in May; something to look forward to for sure. And your idea of tucking Christmas cards around is wonderful. 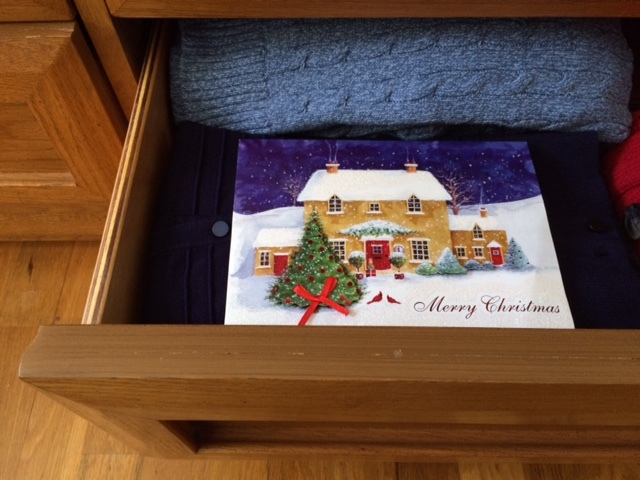 As you open a drawer you meet an unexpected message of peace and joy, as well as a connection to the sender. I will (as usual) be doing my Christmas cards late this year. That is one way to hang onto the Christmas season; but I like yours better. My two favorite cards this year are from my Mom and from you and Steve. I have them displayed in my kitchen. And, by the way, I have saved every single Christmas card from you, along with your family newsletters. So even though connected via the internet I love still getting your yearly updates. Peace, Love, and Joy to you and yours, Nancy, and prayers for a Blessed New Year 2017! Thank you for your support of the once-a-week plan, Cheri. Won’t we have fun in 2017 with “our” new babies? I’m honored you consider the Ruegg Reports worth saving! And thank you for speaking a blessing of peace, love,and joy over our family. I pray the same for you, too.